Gilbert & Sullivan apart, the Thespians had felt for some time the need to produce a programme of essentially English music. 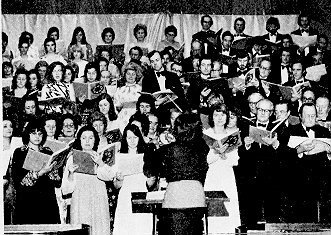 The opportunity came in March 1975, when Vera Mallett put together an evening of almost entirely English music of all kinds, with Roger Newman Turner as the narrator. 'Victoriana' was probably the most successful entertainment of this format to date. The nostalgia for Victorian entertainment seemed to match the mood of the time. A Mrs Beeton recipe was served at the tables and the programme of opera, operetta, music-hall ballads and parlour music, with its finale of 'Land of Hope and Glory', was given during the week-long run to packed audiences in the Town Hall. Margaret Madison's second production for the Society, in the following November, was the Rodgers & Hammerstein classic, 'South Pacific'. There was no doubt of its appeal, as the delighted smiles of the Box-office Manager testified. Nor did the presentation, at St. Francis Theatre, fall short of public expectation. The American accents affected by the performers met with the general approval of members of the United States Army Air Force who attended one performance and there was a touch of authenticity provided by the Stars and Stripes flag used in the show, for it had once flown over the White House itself. Thespian productions are planned at least a year in advance and, already, serious thoughts were being given to the seventy-fifth anniversary year and its coincidence with the Queen's Silver Jubilee. At the same time, however, there was the more immediate and pressing business of putting into rehearsal and staging the 1976 productions. First of these was a repeat performance of 'Carmina Burana', for which there had been a constant demand from members since the 1969 production. Once again, the Society and the audiences loved it and, once again, the box-office was in the happy position of sticking 'Sold Out' notices across the posters. 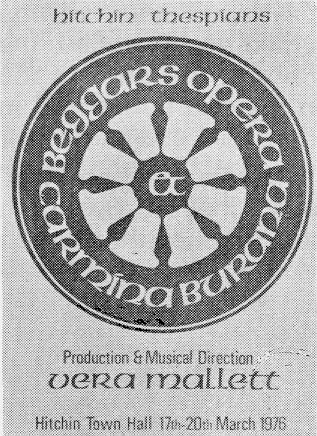 'Carmina', performed at Hitchin Town Hall in March, was preceded by an abridged version of 'The Beggar's Opera', by John Gay, which, though of a very much lighter nature, proved an ideal companion piece. The entire production was in the hands of Vera Mallett who also, of course, conducted the performance. 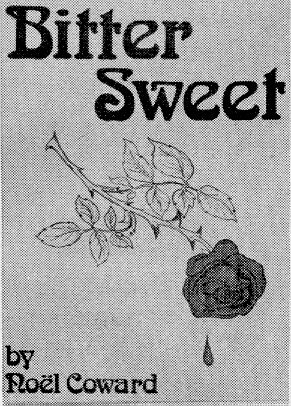 Revival, indeed, was the order of the year for, twenty-five years after its first performance by the Society, and with Bill Patenall back as producer, 'Bitter Sweet' was presented at St. Francis Theatre in the following October. The show lived up to its title too, it the company thoroughly enjoyed it, it was notable for giving plenty of head-aches from start to finish. The libretto, published vocal score and conductor's score seemed to have little in common and major revisions and re-arrangements had to be made by the Musical Director. Sadly, it was not an outstanding box-office success, though the audiences showed their appreciation each night by louder and more sustained applause than for many a year. The critics, too, enjoyed it. 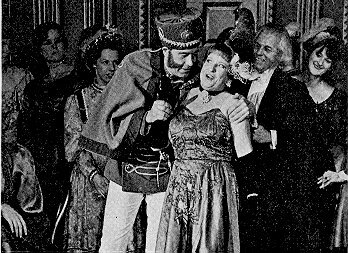 'Hitchin Thespians', said the 'Gazette' have set themselves a high standard and with the much-loved romantic story of Noel Coward's 'Bitter Sweet', they were sure of success with their present production'. The 'Comet' declared that 'Hitchin Thespians lived up to their reputation for performing first-class musical entertainment with their latest production. And so to 1977. When the Committee came to consider the programme for the year, it became apparent that the problem was to choose works which would be truly representative of the Thespians' wide-ranging repertoire while relating to the Queen's anniversary and to the origins and traditions of the Society. The opening of the new Gordon Craig Theatre in the Stevenage Leisure Centre could hardly have happened at a more appropriate time. For many years the Thespians have entertained audiences drawn from all over North Herts, while the Society's membership covers an area including Bedford, Biggleswade, Royston, Letchworth, Hitchin and Stevenage. Thus it was decided that the first production of the 1977 season should take place in February at the Gordon Craig Theatre. The show chosen - 'Robert & Elizabeth' - the story of the romance between Robert Browning and Elizabeth Barrett, is modern and entirely English. Once again, Bill Patenall was engaged as producer. 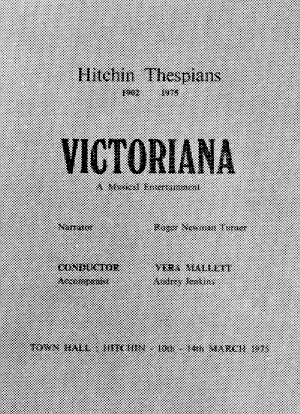 After Stevenage, Hitchin, and a programme, devised by Vera Mallett, of music illustrating the various periods of Her Majesty's reign, entitled 'Jubilee'. This would be staged in March at the Town Hall and would continue the format begun with 'The Story of Gilbert & Sullivan'. Next, in June, a performance of Coronation music, in conjunction with St. Mary's Church choir, to be given in the Parish Church, in which the Society has presented sacred works at regular intervals over a number of years. Finally, the Autumn production, to be presented at St. Francis Theatre, Letchworth. But which show? An English show, with royal associations, in the best operatic traditions of the Thespians, and recalling their earliest days. The choice was not difficult - Gilbert Sullivan's 'The Yeomen of the Guard', timeless in its appeal, full of colour and tuneful music and last performed by the Society to celebrate its Golden Jubilee. What of the future? Suffice it to say that the reasons which prompted the Rev. Gainsford and his fellow enthusiasts to found the Society still exist and that membership of the Thespians, whether as singers, stage-crew, backstage or front-of-house helpers, is still a source of endless pleasure to a large and increasing number of people. The Society has a widespread and devoted following, and public support encourages the maintaining of those high standards for which it is justly renowned.